If you are looking for a way to take your love for the gentle art to the next level, perhaps you should consider competing. Competition not only helps you progress in BJJ, but also puts all that you’ve learned in the classroom to the test. In a competition, you put everything on the line – nothing can compare to the duress and intensity of a tournament. For many BJJ practitioners, regardless of their level, competition can be a daunting experience. You need to make weight, be physically fit and conditioned enough to win and have exceptional technique for your belt level. Then there’s the pressure from your coaches and teammates to perform well, the noise from the audience and your own nerves – this could certainly be a lot to deal with. Because of this, remembering the rules of the tournament could prove to be difficult. Even if you aren’t planning on competing, learning the rules for competition will help you understand the importance of what your professor teaches in class. How to win: To win a match, you must outscore your opponent or submit them. Points are rewarded to competitors for gaining certain dominant positions and the actions they take to get there. Advantage points are given for “almost” earning a point or submission. Also, if your opponent does something unacceptable, he will be disqualified, which will give you the match. When a technique forces an athlete to admit defeat, this is considered a submission. Usually, this is done with tapping (physical and verbal). 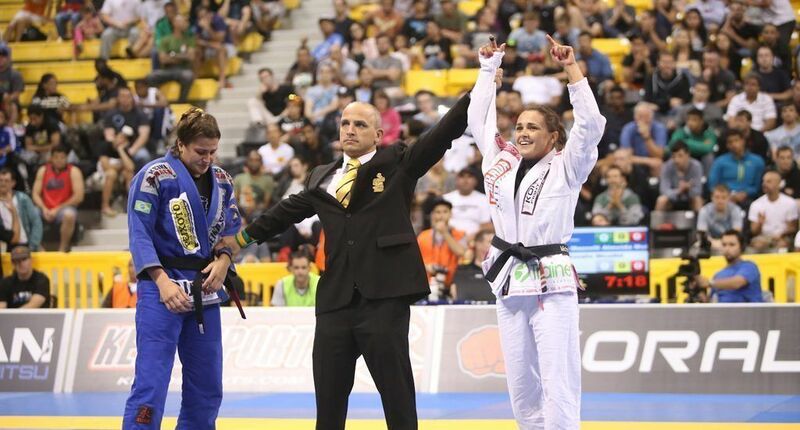 8 x BJJ World Champion Michelle Nicolini is the newest member of the Evolve Fight Team. This is one of the most advantageous positions for any grappler. In this position, you should be able to grab ahold of your opponent’s neck and wrap your legs around his/her waist. Your insteps must be on the inside of your opponent’s thighs. If both your heels are not in this position, you won’t be awarded any points. This is the most dominant position in any match. This position is achieved when you are able to sit on your opponent’s torso. If one knee and one foot are on the ground, it will also be considered a mount. If you are in the top position and able to establish a dominant position over your opponent’s torso, controlling him and leaving him no space to escape or move, you have successfully passed the guard. Hence, the action of passing will give you 3 points. To receive the points, you must establish this move for 3 or more seconds. If your opponent is able to escape, an advantage will be awarded instead. If you are able to place your knee and shin across your opponent’s stomach while holding his/her collar/sleeve and belt/pants, you have achieved the knee on belly position. To receive the points, you must be able to hold this position for at least 3 seconds. If your opponent is able to escape, an advantage will be awarded instead. A sweep is performed to reverse the opponent from top to bottom position in a way that he/she is unable to defend or post. If the move does not begin from inside the guard or half guard, you will not receive points. If you are able to take your opponent down to the ground and control them, you will be awarded 2 points for your takedown. Your opponent must land on his/her side or back in order to receive the points for the takedown. BJJ World Champion Xande Ribeiro has won many competitions with the armbar submission. You cannot slam your opponent – Not only could this move potentially injure your opponent, it is also considered illegal in IBJFF rules. 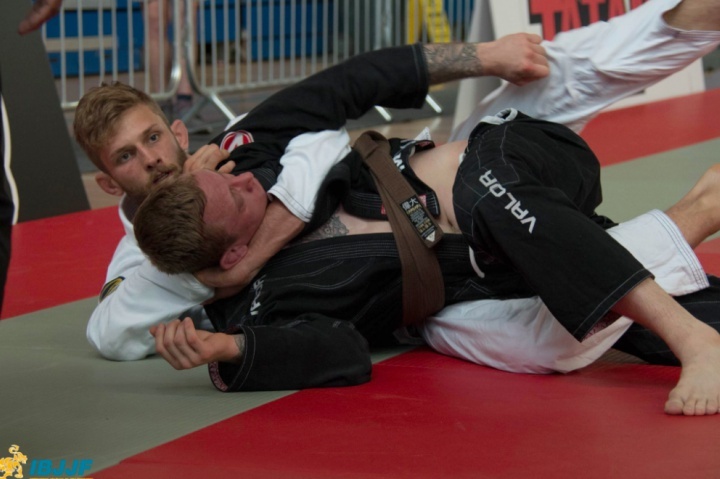 If you plan to pull guard, act quickly – If you and your opponent race to pull guard and you fall back as you attempt to pull him into your guard, they get 2 points for a sweep. You will get penalized for talking to the referee – No, you cannot sweet talk your way out of that knee reap. Talking to the referee will only affect your score, and not in the way you’d like. You will get disqualified for stalling – So you’ve finally established your position against your opponent and you’d like to stay there till the match finishes. Unfortunately, this is called stalling and could earn you a penalty, or worse, could potentially disqualify you. Unless you’re in the mount or back mount, you need to keep on moving! You have 20 seconds to tie your belt – Just because your belt fell on the ground, it doesn’t mean that you should take this time to recover from your match. If you take longer than 20 seconds, you will be penalized. You don’t get any points for side control – Being in side control will only give you points if you’ve passed the guard or swept your opponent beforehand. Cranks are not submissions – If you’re thinking of using a neck crank, don’t bother. You’ll be disqualified for it. Reaping the leg – Reaping, or bending your opponent’s leg inwards is an illegal move in IBJJF rules. If you’re looking to attack your opponent’s leg, ensure that it is straight or bent outwards. Use foul language, cursing, or any other immoral acts of disrespect towards the referee or any of the assisting public. Biting, hair pulling, intentionally placing fingers in eyes, nose or mouth, intentionally seeking to injure genitalia or the use of fists, feet, knees, elbows or heads with the intention to hurt or gain unfair advantage. Running out of the mat area when put in a submission hold. Although this is by no means an exhaustive list of IBJJF rules, it covers all that you need to know before competition day. For more details about IBJJF rules, visit the IBJJF website.